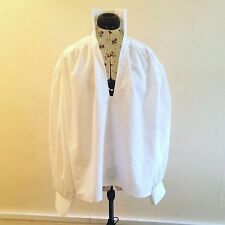 Take a look at our Site: Mrs Papendick Historical Seamstress White cotton Georgian/ Regency/ pirate voluminous shirt. With straight cuffs and high collar. Free neck cloth included. We have these shirts in a wide range of sizes in stock just let us know YOUR measurements for: Chest Arm - shoulder to wrist neck length - neck to hem and we shall send you an appropriately sized shirt. Please look at my other listings for further Regency inspired items or you can check us out on Facebook - Mrs Papendick, Historical Seamstress. Shirt in good condition, but has a small repair stitching at the back under the neck collar, see photos. Size Large. This tunic is made from a light weight polyester cotton mix in black, with gold coloured trim at hem and sleeve ends. Ideal for wear at a feast or similar. It has a fully faced key hole neck line with a small slit to sit flat under outer wear and armour. 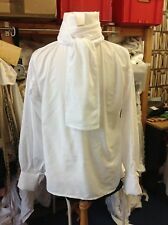 Georgian/ Regency Ivory Linen Jabot Shirt. Take a look at our Site: Mrs Papendick Historical Seamstress Ivory frill front Georgian/ Regency voluminous shirt. With flounce cuffs. Free neck cloth included. We have these shirts in a wide range of sizes in stock just let us know YOUR measurements for: Chest Arm - shoulder to wrist neck length - neck to hem and we shall send you an appropriately sized shirt. Please look at my other listings for further Regency inspired items or you can check us out on Facebook - Mrs Papendick, Historical Seamstress. White cotton frill front Georgian/ Regency shirt. With flounce cuffs. Length 28". Arm 24 1/2". Custom made heavy cotton shirt with wide sleeves. This unique tunic is made from a series of panels in a dark brown and a cream colour. The key hole neck line is flat and sits well under over layers. This tunic is made from a light weight polyester cotton mix in off white. Ideal for wear under a gambeson or similar. It has a fully faced key hole neck line with a small slit to sit flat under outer wear and armour. Georgian/ Regency Style Ivory Linen Shirt And Neckcloth. The neck line is fully faced and will lie flat under gambeson or similar. The simple T design has sleeves set into straight edges a long the body. Side slits allow for move,ent and running in LARP situations. Perfect for Renaissance or Shakespearian events, also Steampunk. We specialize in designing and making historically inspired dresses, gowns and jackets. 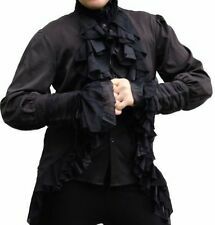 Includes: 1 Victorian Gothic blouse (cotton). Comfortable and romantic white 100% cotton blouse in Victorian style. As you probably know you would add the collar and then the waistcoat covers the cotton section so you just see the silk front. My family have been in magic and performance since 1898, so we have a knowledge of the Edwardian era in particular.". Made to approx. This tunic is made from a polyester cotton in off white with brown cuffs and hem line. SIZING GUIDE. Length from Hem to Hem at the back: 24". 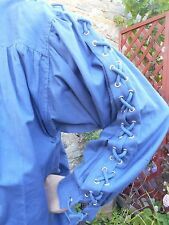 Elasticated Sleeve is set between 7-8" from underarm. Custom made heavy cotton shirt. From Camden Markets Online: NEW Gothic pirate shirt with eyelets & laces, black. Showgirl Blue Corset and Tail Train.